Last week I wrote that Amazon’s (alleged) entry into the air freight business was less of a threat to FedEx and UPS than it first appears. 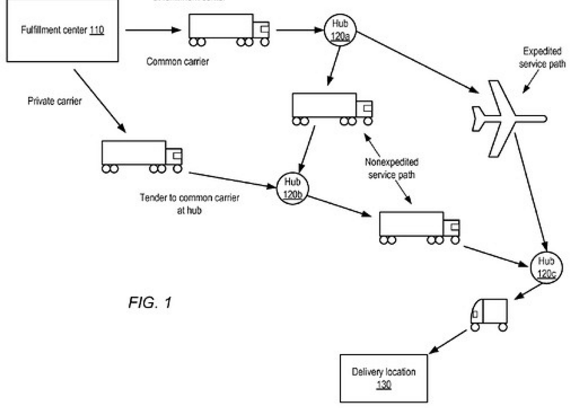 Some healthy discussion on Twitter convinced me I was wrong, and that combined with Amazon Flex, the company’s network of independent delivery contractors, the project could represent a grave threat to the two companies. I’ve rewritten the post based on the feedback I received. Thank you all who shared their thoughts about the post, particularly Paul Graham, Robin Debreuil, John Marbach, and Jasper Smit. The original post lives on here. If the reports are true, Amazon is leasing Boeing 767 jets to get tighter control (and presumably better pricing) on its logistics. UPS and FedEx need to go into full-on war-time mode: Make no mistake, Jeff Bezos will one-day use this fleet of jets to launch a direct frontal assault on their core parcel delivery business. When he does, we can be sure the company focus relentlessly on becoming the low-cost provider with the best customer experience, the same combination that’s made Amazon such a powerful force in all the other markets where it plays. Amazon already offers parcel shipping for Fulfillment by Amazon (FBA) customers, but only if shipment starts at one of its distribution centers. That could change. In September it told us about Amazon Flex, the plan to hire independent contractors to deliver packages. It’s already live in Seattle, Richmond, Nashville, Austin, Dallas, Baltimore, Miami, Atlanta, Houston, San Antonio, Las Vegas, Phoenix, Minneapolis, and Indianapolis, with New York, Chicago, and Portland coming soon. For now Amazon Flex only picks up packages from its own distribution centers, but it doesn’t take a big stretch of the imagination to see how it could offer pickups from other businesses. Operating its own jets, Amazon could connect the networks of independent contractors in these cities to create an end-to-end express parcel delivery service. The worst thing for the parcel integrators is that Amazon can spend years perfecting its parcel delivery network before ever feeling pressure to offer the service to the public. And just as with AWS, Amazon gets to build the parcel delivery infrastructure whether or not it ever decides to offer the service publicly. The company spent $8.7 billion on outbound shipping in 2014, up from $6.6 billion in 2013. I don’t know what Amazon might pay to lease the jets, but Delta just bought a 777 for $7.7M, so the investment is small in the grand scheme of things. Wall Street is in love with the AWS business, and rightly so, but Amazon knows its brand promise is all about offering the best e-commerce experiences with by the lowest costs. That means relentlessly driving down prices. Operating its own jets would let Amazon control its delivery process from end-to-end, not only cutting out the parcel integrators’ margins, but also eliminating the transaction costs from having to deal with an outside vendor. The jets could also help with the company’s efforts to dynamically locate inventory closer to predicted customer demand. Two years ago the company patented “anticipatory shipping” which means it will reposition inventory as close as possible to predicted demand. Diagram from Amazon’s patent filing. Note the jet’s owner is not labeled. A key cost driver in Amazon’s e-commerce business is the working capital cost of inventory. By operating jets, Amazon could fulfill products from distribution centers further away and still keep its delivery promises. That means it can keep less inventory in nearby DCs, reducing the capital needs of the business. FedEx and UPS need to go into full-on war-time mode. They’re losing a customer worth as much as 10% of their total revenue, and potentially gaining as fearsome an adversary as we’ve seen in modern American business. FedEx and UPS’s saving grace may be that Amazon will struggle to compete in the international parcel service. FedEx and UPS earn 44% and 38% of their revenues from the international express business, respectively. Brands that compete with Amazon—and who doesn’t these days—won’t trust Amazon with the sensitive data they’re required to turn over to their international parcel shipping provider. When a company imports products from overseas, it has to disclose details on the origins of those products to U.S. Customs and Border Protection. These details include the name of the supplier, the purchase price, the number of units, and more. If Amazon were managing the air freight for these shipments, it would have access to all the data needed to buy goods directly from the source for less. Amazon has earned its reputation for ruthless competition. Do brands really want to turn over their entire network of international suppliers to a competitor just to save some money on parcels? As a counter argument, some have argued that Netflix uses AWS for hosting despite its fierce competition with Amazon Prime Video. But they miss the point, that Netflix wouldn’t use AWS so if it also had to share the licensing terms for every video. Still, even without tackling the international parcel business, Amazon’s foray into the domestic parcel business would represent a grave threat to FedEx and UPS. I can imagine few images scarier than Jeff Bezos coming after your market with a fleet of jets. It will be fun to watch.